Leeds Grand Theatre is set to feature in the latest Leeds Town Hall exhibition, showcasing cultural institutions from across the region. More than 20 archive and contemporary images that celebrate the opulence of Leeds Grand Theatre will be on display from Monday 12th February until the end of June 2018 in the Staircase Gallery. The exhibition is open to all. Leeds Grand Theatre’s beautify audience view from the Upper Circle. Credit: Simon Hulme. Built in 1878 with an intriguing mix of Romanesque and Victorian Gothic styles, Leeds Grand Theatre was a major milestone in Victorian design and was once described as ‘probably the finest of its size in Britain’. The famously spacious and highly raked stage is on a par with leading London theatres. Star performers to have tread the famous boards include Julie Andrews, Ken Dodd, Margot Fonteyn, Bruce Forsyth, Alec Guinness, Elton John, Marie Lloyd, Morecambe and Wise, Laurence Olivier, Cliff Richard, Tommy Trinder, Barry Humphries as Dame Edna Everage and the late Sir Roger Moore. 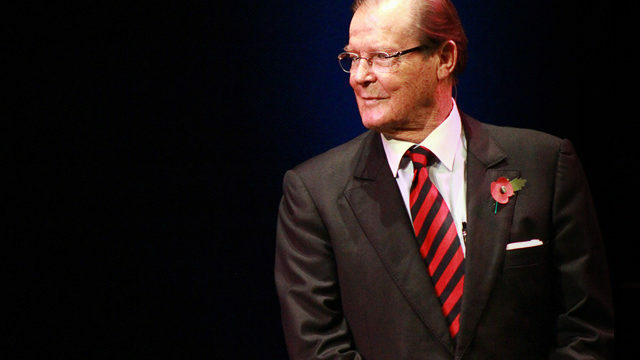 Sir Roger Moore at Leeds Grand Theatre. Photographer: Samuel Payne. 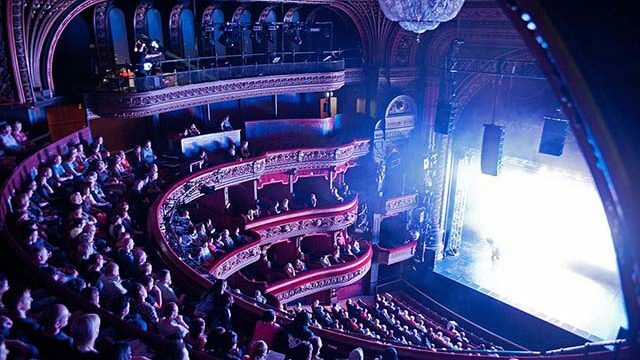 Since its ‘transformation’ in 2006, the theatre has hosted the best of the West End and other touring productions, including large musicals, drama from the National Theatre, comedians and music, as well as continuing to provide a home venue for Opera North and Northern Ballet. Productions and artists set to perform at the Grand in 2018 include Take That’s new musical The Band and Yorkshire favourite, Calendar Girls The Musical, the premiere of Sting’s The Last Ship, Wicked, Motown, Jersey Boys, Art, The Comedy About A Bank Robbery, Northern Ballet’s Jane Eyre and The Nutcracker, and Dara Ó Briain and Jane McDonald. Book tickets online at leedsgrandtheatre.com or call Box Office on 0844 848 2700.